It shocked me to learn recently that widows are one of the fastest-growing segments of the U.S. population. The Census Bureau says they numbered almost 12 million in 2011, and their ranks are growing by nearly 1 million every year. She’s working hard to help more advisors bridge the gap. The author of “Moving Forward on Your Own: A Financial Guidebook for Widows,” Rehl has been a financial advisor for 17 years and is a widow herself. Now the president of Rehl WEALTH Collaborations LLC in Land O’Lakes, Fla., she has relinquished her RIA hat to focus on assisting widows and their advisors. In view of this client segment’s growing importance, I recently asked her what advisors need to know to serve widows better. Early in widowhood, this very competent financial planner felt totally incapable of helping herself. “I didn’t realize what happens to a widow’s brain in early grief,” Rehl said. Eventually she was able to compose herself, do some financial calculations, talk with her own advisor and realize she was going to be okay. This enabled her to resume normal functioning as her clients’ advisor. The experience changed her professionally as well as personally. “By the end of the first year after Tom died, I realized I wanted to help my widowed sisters who were going through this traumatic life transition,” she explained. In the grief phase, financial triage is necessary. “She needs to be heard and understood,” Rehl said. “She’s highly vulnerable, partly because her thinking is impaired.” During this phase, widows may make a hasty decision to sell the house and move near their adult children, or let a financial salesman talk them into investing the life insurance proceeds in something they don’t understand or need. Progress in moving forward can be gradual. On some days, the widow may feel she’s taking two steps forward and one step back. On other days, it might be two steps forward and three steps back. During this phase, an advisor’s role is chiefly empathetic listening. The widow’s main concern is “Am I going to be okay? Do I have enough to live on?” In Rehl’s experience, virtually every widow has bag lady fears in this stage. In the growth phase, the widow’s cognitive functions return to normal. “This is the time for general financial planning—investments, taxes, pre-retirement or post-retirement decisions and basic estate planning,” Rehl said. Discussions may focus on whether the widow will stay in her home or not. A younger woman with children still in school may feel that remaining in the family home is important. An older widow may want to leave a place where there are too many memories of a beloved spouse, while some others find comfort in this. 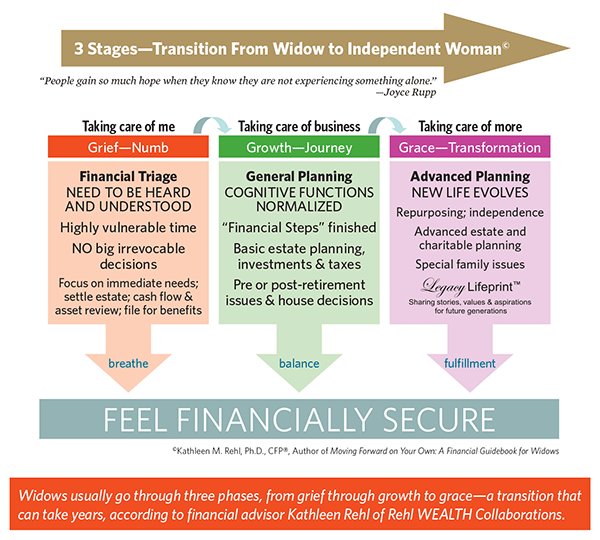 During the growth phase, an advisor should consider serving as a “thinking partner” to help the widow sort through her choices. Empathetic listening is crucial in this phase, too. But whereas in the grief phase she may have nodded without hearing or understanding a word you said, now you can make suggestions and find her ready to hear and understand them. During this phase, advanced estate and charitable planning is finally appropriate. You might help her focus on special family issues, such as setting up an education fund for the grandkids or helping an adult child with a business venture. “This is when sharing her story, her life lessons and her legacy with her loved ones is appropriate,” Rehl said. In her work with widows, Kathleen Rehl has found that many of them encounter five pitfalls. 2. Falling prey to financial wolves. Because they’re so vulnerable, new widows are often targeted by predators and other unethical individuals. 4. Avoiding reality. A new widow needs to pay attention to money coming in and going out so she can create a spending plan. She may want to keep certain investments because her husband chose them—“the hand reaching out from the grave,” as Rehl put it. She needs to understand that letting go of an investment to protect her well-being might be what her husband would have wanted her to do. 5. Becoming a purse for others. Family members and friends may tug at her, asking for financial support. She needs to be coached to say, “That’s an interesting idea. I’ll discuss it with my financial advisor.” To protect herself, a widow also needs to learn that her financial information should be shared only with people she knows and trusts. Rehl offered six general tips to help advisors work more effectively with a widowed client. 2. Become her “thinking partner.” “Forget about the financial jargon and fancy charts,” Rehl urged. “Just talk to her in plain English about her needs and goals.” A new widow’s brain freeze is very real. Find the right time to teach when she’s not feeling overwhelmed and numb. 3. Encourage her to take her time with decisions that aren’t urgent. She doesn’t need to instantly rebalance her portfolio. 5. Offer to help with activities that seem overwhelming. Rehl has accompanied clients to their attorney’s office to settle the estate and has even recommended handymen to widows whose husband used to fill this role. 6. Show compassion and care. In addition to giving a widowed client empathetic support, an advisor should encourage her to take part in grief classes or support groups offered by local hospices, congregations or online resources. Well-received books that have helped many women include “Widow to Widow: Thoughtful, Practical Ideas for Rebuilding Your Life” by Genevieve Davis Ginsburg; “For Widows Only!” by Annie Estlund; and Rehl’s own guide, “Moving Forward on Your Own: A Financial Guidebook for Widows” (See sidebar, “A Resource for Widows and Their Advisors,” page 43). Last year Rehl started a new firm, Rehl WEALTH Collaborations. I asked her what she hoped to accomplish with her new business and why she decided to close her financial planning practice after 17 years. “Last year I made 37 presentations across the country about assisting widows with financial and life transitions, while still seeing individual financial planning clients,” she said. “I needed to choose one path or the other.” Realizing she could reach more people as an educator and speaker, she worked out a succession plan for her financial planning clients. It took a year to transition them to other advisors. She expects 2014 to include presentations to advisors and groups of widows, small-group retreats, advisor workshops and one-on-one coaching, along with new educational materials (See sidebar, “Learning More About Working With Widows,” above). The demand to share what she has learned is both encouraging and rewarding.